As of Sept. 30, 2010, the defined-benefit pension plan in the Michigan Public School Employees’ Retirement System had an unfunded liability of $17.6 billion. This unfunded liability and the large annual payments necessary to fund it suggest the plan’s liabilities should be contained by closing the plan to new entrants, much as the defined-benefit pension plan in the Michigan State Employees’ Retirement System was closed in 1997. Future public school employees would be offered participation in a 401(k)-style defined-contribution plan. A concern repeatedly raised about closing the MPSERS plan, however, is the so-called “transition costs” involved. This paper discusses these “transition costs,” their validity and ways to minimize or eliminate them if they are considered barriers to the important and necessary reform of closing the MPSERS defined-benefit plan. Normal cost refers to the annual cost of paying for employee pension benefits earned during that particular year. According to the SFA, HFA and ORS analyses, these costs would increase if the defined-benefit plan were closed and new entrants were placed in a defined-contribution plan similar to MSERS’. This conclusion is questionable. The stated normal cost for the MPSERS defined-benefit plan has almost certainly been understated by a debatable assumption of 7 percent to 8 percent annual pension asset growth. The failure of this assumption is clear from the plan’s asset growth over the past 14 years and the plan’s large and growing unfunded liabilities. of employee salary — a total employee and employer contribution similar to that of the MSERS defined-contribution plan in fiscal 2010. The larger “transition cost” discussed in the three papers is the immediate increase purportedly required in the size of MPSERS’ “amortization payments,” which are deposits made annually by MPSERS employers to pay down the defined-benefit plan’s unfunded liabilities. These amortization payments ensure the pension plan can meet its future pension obligations. The rules of the Governmental Accounting Standards Board are frequently interpreted to mean that if the MPSERS defined-benefit plan were closed to new entrants, the MPSERS amortization payment schedule would need to change to a “level-dollar” treatment that would calculate larger upfront amortization payments than those projected if the plan were to remain open. The expected increase is large in the first year — the Office of Retirement Services places it at $360 million — but would decline over the next seven years and ultimately produce lower projected payments than under MPSERS current “level-percentage” amortization schedule. In fact, if all went as expected, there would be a projected net savings in total amortization payments over time. Three things should be noted about this immediate “transition cost.” First, GASB rules govern how MPSERS and other government entities report their expenditures; the rules do not tell policymakers what expenditures they should make, as GASB itself has confirmed. Thus, even if the state were to adopt a level-dollar amortization payment schedule in reporting on a closed MPSERS plan, it would make increased immediate payments only if it chose to. Second, the phrase “transition cost” is misleading. MPSERS’ cost is the underlying pension liability, which would not change; the cost is not the amortization payments used to meet that liability. Hence, even if MPSERS employers paid more at first, the plan’s cost would not increase any more than a large first payment on a mortgage would affect the value of a home. Third, the emphasis on normal and amortization “transition costs” ignores a considerable additional cost: the potential that unfunded liabilities in the MPSERS plan will become even more burdensome. In fiscal 2010 (excluding the cost of an early retirement incentive), the unfunded liability in the MPSERS defined-benefit plan increased by $4.3 billion — nearly a tenth of the annual state budget. Since fiscal 2000, the unfunded liabilities of the plan have increased by 6,500 percent, and the state has failed to make GASB’s “required” annual payments eight times. If policymakers nevertheless perceive “transition costs” for amortization payments as a problem, they have alternatives. Five are provided in the study, listed from most comprehensive to most limited. First, since MPSERS pension liabilities must be met under the Michigan Constitution, policymakers could scale back MPSERS’ extensive retiree medical care coverage, which is not protected under the Michigan Constitution, and which cost MPSERS employers $795 million in fiscal 2011. The retiree medical reduction need not be $360 million, given that the “transition cost” would decrease in subsequent years, and given that the Legislature could tap $133 million already slated for MPSERS reform. Second, policymakers should consider making the most of MPSERS reform. 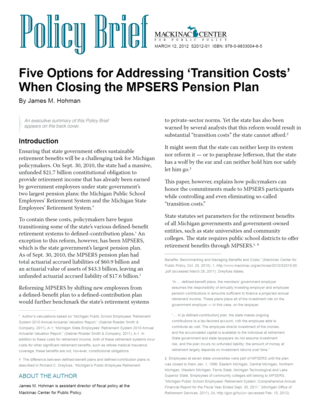 If there are upfront “transition costs,” the Legislature could maximize the benefit of incurring those costs by not just closing MPSERS, but also freezing it — that is, providing current defined-benefit plan members with a defined-contribution plan in lieu of their current plan, so that they would earn no additional benefits under the defined-benefit plan. This step would considerably decrease the potential future unfunded liabilities of the MPSERS pension plan. In addition, GASB appears to provide flexibility in choosing an accounting treatment for the amortization payments on a closed and frozen plan, making it even easier for the state to adopt a payment schedule that minimizes immediate costs. The state’s third-best course is simply to pay the “transition costs.” MPSERS’ unfunded liabilities have built up over years, and they must be made good at some point. Making larger amortization payments sooner rather than later will not only ensure that retirement assets are available as employees retire, but reduce the projected total burden of amortization payments on taxpayers as well. Policymakers have additional alternatives, however. Legislators have frequently failed to make the “required” amortization payments under GASB schedules, and they could continue this “business as usual” with a closed plan by reporting under a level-dollar schedule, but making level-percentage payments. Alternatively, legislators could also choose to spread the amortization payments across the entire MPSERS payroll, including the payroll not just of members of the defined-benefit plan, but of the new defined-contribution plan as well — something the state is already doing with MSERS. The state could then maintain a level-percentage accounting treatment for MPSERS. Each of these five approaches to amortization payments would make it easier for policymakers to honor their constitutional obligation to pay MPSERS pension benefits.